Was there really a body beneath that gravestone in a Huntley backyard? Laurel Mellien didn’t think so. Why, then, was the gravestone there? Mellien, a cemetery art researcher, had to find some answers. She knocked on the front door and introduced herself. Intrigued by the discovery, the Lake in the Hills resident started researching. She soon had an answer: There was no body in the backyard. By now, Mellien is used to the crazy questions and the funny looks she gets when people learn that she studies gravestone artwork. But she’s made quite the living among the dead. Mellien’s quest has taken her to every cemetery in McHenry and Kane counties, and to cemeteries across the country. Looking only at the artwork, she can tell you significant details about a person’s life. Give her time to do genealogical research, and she’ll spin a tale. Tragic deaths, sordid affairs, lives invested in prominent fraternal organizations – she’s found it all, and she has the collection to prove it. Locally, you might recognize Mellien for her Headstones & History talks at local libraries and history groups. But on the national scale, she’s gained recognition for her deep and colorful understanding of Victorian-era macabre and the way cemeteries memorialize lives well lived – and lives extinguished too soon. Mellien’s interest in gravestone art began on a family trip to Springfield, Ill. Touring Oak Ridge Cemetery and Abraham Lincoln’s tomb, she and her son rented a cassette tape that highlighted the cemetery’s famous residents and their graves. Within two years, she’d amassed enough research to host a photo exhibit at Huntley’s public library, where she was working as a coordinator of children’s programming. The Civil War memorial in Crystal Lake’s Union Cemetery is made of “white bronze,” a stone substitute once popular for headstones and memorials. Look for the rare typo on the statue’s base. “There was a wide age range and a lot of people were interested for a variety of reasons, sometimes because it was a little bit creepy, other times because it helped their genealogical research,” she says. In 2007, Mellien’s research led her down a new path as she was recovering from an illness. She decided to make a career of her hobby. Intent on writing a book about McHenry County’s cemeteries, she started digging up newspapers and genealogical records. She visited every cemetery in the county – nearly 100 in all, from big ones to backyard plots. She joined historical societies and the Daughters of the American Revolution (DAR). Then, in 2009, she was invited to speak to DAR about cemetery art symbolism. She now gives talks on several subjects at local libraries, historical societies and genealogical groups. She has spoken at Crystal Lake’s Raue Center for the Arts and at a historical society benefit inside a funeral home. President Lincoln’s tomb influenced Mellien’s research in more ways than one. The Civil War marked a turning point in how Americans mourned the dead. Mellien has collected many images from around McHenry County, especially at Crystal Lake’s Union Cemetery. The Civil War soldier, in particular, interests her because of its composition. It’s made of “white bronze,” a brand of zinc memorials made popular in the late 1800s. 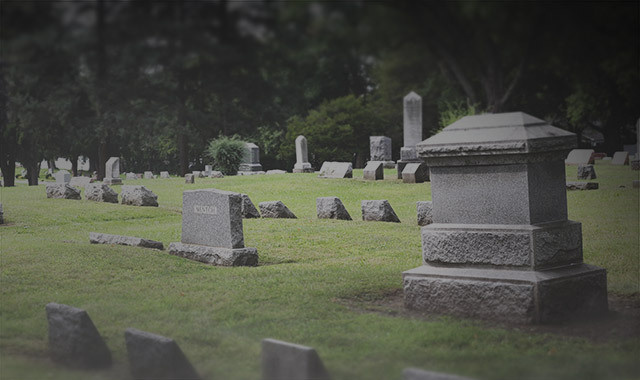 These bluish-gray monuments, used for statues and headstones, were a common substitute for stone and have proven to be fairly weather-resistant. You can usually identify these zinc memorials by a plaque affixed to their backside. A close look at the plaque beneath Crystal Lake’s soldier reveals an error. 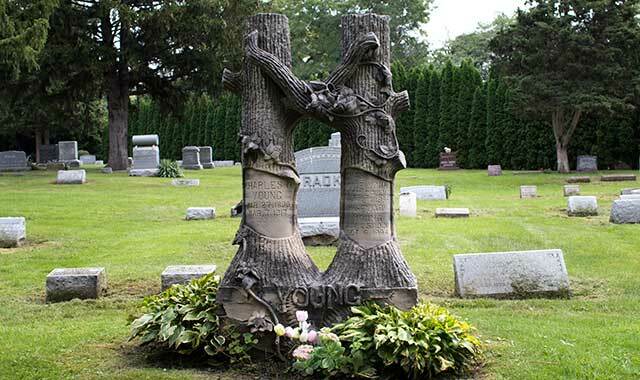 While you’re in Union Cemetery, look for the intricately carved double tree monument – a stone marker in the shape of two interwoven trees. Such markers are rare, says Mellien, and are typically a symbol of married couples – except at Union Cemetery. In Algonquin Cemetery stands the towering Guy Frary family monument. It was so large that it arrived to town on four flatbed railcars and caused a stir among residents concerned about its potential to topple over. Like many of the monuments Mellien photographs, the Frary monument provided a powerful remembrance of loved ones. Beyond the northwest suburbs you may spy the occasional picture memorial, comprised of a weather-protected photo affixed to a headstone. These were first produced in the U.S. by J.A. Dedouch Company, in Chicago, and were especially popular around the early 1900s. Some picture stones show the person at a happy period in life, like a wedding. There are many examples in the Mount Carmel Cemetery, in the town of Hillside, which has a heavily Italian population. “They’d prop the person up, eyes open, if they were children,” says Mellien. Double tree stones like this one in Crystal Lake’s Union Cemetery are extremely rare, says Laurel Mellien. Although most bear a husband and wife’s name, this one bears a husband’s name and those of other family members. The wife remarried and is buried elsewhere in this cemetery. About a year after she found the erroneous gravestone in Huntley, Mellien received an unexpected call. The homeowners were selling the house and needed proof that there was no body in the backyard. In her pursuit of McHenry County’s macabre, Mellien has unearthed many fascinating stories like this – so many, in fact, that she’s been collecting them in her own book. She expects to release the self-published title soon. Poisonings, suicides, train deaths – she’s found a variety of sordid tales, all described in gruesome details by newspapers of the day. Few, though, compare to the grave robbery in Algonquin. Police in Chicago had received a tip that the body was being shipped in a barrel. Police apprehended the courier, returned the body to Algonquin and arrested the two men who had taken the body: Soloman Babbitt and a Dr. Winslow. Both were taken to Algonquin for trial. Mellien finds her most consistent audience among genealogical researchers tracing their family histories. The techniques she’s used to research local cemeteries offer many clues for descendants. One of her go-to sources is the McHenry County Genealogical Society’s four-volume set cataloging every row and burial in area cemeteries, from early settlers to the mid-1990s. The set is available in most area libraries, she says. Libraries around Kane County and greater Barrington have similar resources, including rooms dedicated to genealogical studies and local indexes. Some resources are also available online. Mellien loves her work and loves sharing her passion. It’s not just the stories of local lives that fascinate her. It’s also the way these lives are memorialized, for perpetuity, in our cemeteries. This entry was posted on Monday, October 10th, 2016 at 11:58 am	and is filed under Features, Top Posts. You can follow any responses to this entry through the RSS 2.0 feed. Both comments and pings are currently closed.